The MR350S4-5Hz uses a proprietary pin-out on the PS2, which cannot be connected directly to any laptop or PC without the use of a cable set (USB or RS232 + PS2 for power). 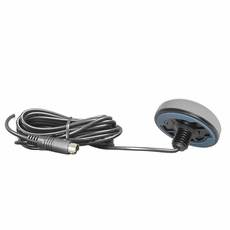 The MR-350 S4 (5Hz) includes an embedded receiver and an antenna. This receiver up to 48 tracking verification channels while providing fast time-to-first-fix, precise position updates, low power consumption, and adds the capability of Wide Area Augmentation System (WASS). The MR-350 S4 (5Hz) design uses the latest technology and high-level circuit integration to achieve superior performance while minimizing space and power requirements. All critical components of the system include the RF/IF receiver hardware and the digital baseband are designed and manufactured by GlobalSat to ensure the quality and capability of the GPS. The MR-350 S4 (5Hz)can be utilized in a variety of applications that require a permanent mounting configuration. With bulkhead (through-hole) mounting and a low-profile housing, the MR-350 is completely self-contained and waterproof. Typical application can include marine environments, aviation, commercial use such as fire truck, police cars and utility vehicles and buses. The extended 4.5 meters cable allows for easy routing to your equipment behind, headliners and side panels and terminates to a custom PS/2 connector.